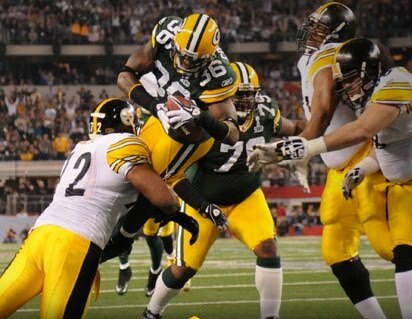 What a great game for Packer nation worldwide. The President and Mrs. Obama hosted a Super Bowl party at the White House for the big game last night. Madison Mayor, Dave Cieslewicz, was invited and brought some great local foods to the party in D.C.
Three of his party-gifts have great connections to Iowa County, Wisconsin, food, fun and agriculture. Included in his gifts was the wonderful pumpkin tortelloni from RP's Pasta, in Madison. We are so proud to be a partner with Peter Robertson and RP's, a great local-foods enterprise success story. The Wisconsin Innovation Kitchen worked under Peter's direction to prepare their pumpkin recipe for filling their (did I say delicious?) raviolis and tortellonis. "Peter Robertson, owner of RP’s Pasta in Madison, works with the Innovation Kitchen to fulfill the needs of a very specific food profile. 'We consciously made the choice that everything we have access to would be made in Wisconsin,' he said. Although several commercial suppliers could make processed foods available, Robertson opted to go with the Mineral Point facility to provide vegetables for his stuffed ravioli and tortellini. 'They did it fast. They did it efficiently. And it’s 100 percent Wisconsin products,' he said." This is a really fun story for those of us at the Innovation Kitchen: A Super Bowl party at the White House and a Packer victory. More important than all that? A satisfied, engaged customer. Thank you and congratulations, Peter and RP's Pasta! And Iowa County continued to shine with Mayor Dave's party gifts with the addition of Extra Aged Pleasant Ridge Reserve cheese from Dodgeville. Extra Aged Pleasant Ridge Reserve won the 2010 American Cheese Society's annual competition, besting over 1400 of the nation's finest cheeses to be crowned Best of Show. Think of what Uplands Cheese has done – they have won the American Cheese Society’s highest honor three times in the last ten years while no other cheese has won more than once. And to complete the fun, Mayor Dave also brought beer from the amazing Lake Louis Brewery in Arena. This great regional brewery produces many wonderful year-round and seasonal beers in Iowa County. Arena is our beautiful Gateway to the Wisconsin River Valley. Congratulations to Mike, Carol, Andy, and everyone at Uplands Cheese! Congratulations everyone at Lake Louis! Innovation Kitchen goodies at the White House Super Bowl party! Uplands Cheese Company. Pleasant Ridge Reserve cheese. Dodgeville, Iowa County, Wisconsin. Photo is of Nick Collins scoring leap, following his interception and runback. Photo is borrowed from the Packers site without asking. Please visit their site for letting me borrow their photo. Video of Nick Collins interception at the Huffington Post. My 'play of the game'. Interesting sale of the Huffington Post to AOL today. I intended to put you a tiny word in order to thank you over again for your personal pleasing strategies you've featured in this case. It has been quite remarkably open-handed of you to give easily what many people could possibly have offered for an electronic book to end up making some profit for their own end, notably now that you might well have done it if you ever considered necessary. These creative ideas in addition worked to become a good way to know that some people have the same interest the same as my personal own to find out lots more with regard to this problem. I believe there are several more fun periods ahead for those who looked at your forum.